During the 1950s the Auckland Branch of the DX League met monthly at various members homes. We were a young and very keen and active group of Dxers. One of them was Des Gate who began DXing as a young man in 1939. Like so many young radio hobbyist at that time, active service during WW2 meant DXing ceased. By 1947 Des was again listening to the world.Life moves on, and we eventually lost touch when Des changed QTH. A few weeks ago though a mutual friend, we regained contact and Des now 80, visited me and kindly donated his collection of 200 odd QSL’s to my collection of DX history. Amongst Des’s QSL cards and letters, were some I have not seen before, but have read about. These are the QSLs from Forces Broadcasting stations, both US and British operating from countries in Europe, the Middle East, Asia and the Pacific. But first I must comment on my astonishment when I saw one other particular QSL from one of the rarest shortwave countries in the world, Western Samoa. 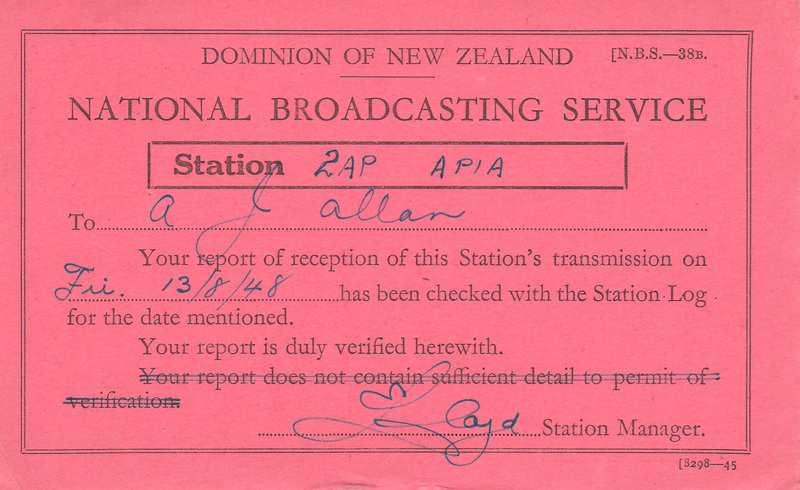 Des had 2 QSL cards verifying his report of 39th January 1948 of 2AP, Samoa heard on 7700 kcs. Both were on the old standard NZ National Broadcasting Service’s pink QSL card.. One had the details written in, the other had them typed in. Both had “National” crossed out and “Samoan” written in. The frequency on both cards, was written in, by Des, and the cards were posted from Samoa. This obviously was verifying a special shortwave broadcast from Apia. The British and particularly the American Armed Forces had radio stations on shortwave and medium wave for the benefit of occupational servicemen from the beginning of the WW2 war until into the 1950s when the US Armed Forces Radio Service dominated. I will go through Des Gates QSL’s from this era. The first was a 1948 card from the American Forces Network, US Army – Navy, based in Munich Germany, listing 6 medium wave frequencies but verifying 6080 kcs on shortwave which it used for many years after the war. Another card was from KZCA, the Armed Forces Radio Service broadcasting from Salzburg, Austria, on 7220 kcs with 200 watts and dated 1947. The next QSL is from a station I do not believe I have heard of before. It was run by the United States Corps of Engineers in Athens, and they had a daily hours program on 8000 kcs. It entailed 15 minutes of news and 45 minutes of transcribed music. The letter advised they were using a Collins 30-K transmitter and 375 watts output to a doublet antenna. The Middle East area was dominated by the British Forces Broadcasting Service. The writer continues with a response to Des’s report of interference from KZCA Salzburg (see above) also on 7220 kcs. He stated that they could not hear KZCA in Cyrus but did have interference from the BBC on 7218 kcs. 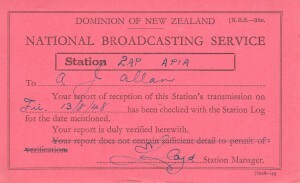 Des’s reception report was the first he had received from New Zealand and had to date, received 3 reports from Australia. The station broadcast 14 hours weekdays and 17 hours on Sunday. Mr Joyce had started a series of test transmissions every Saturday night and during the test presented a short program called REPORTS RECEIVED in which he thanked the many people who sent in reception reports from around the world. The third QSL in this trifecta is from the Forces Broadcasting Service M.E.L.F., Malta. This is a neatly printed and folded card with limited details of the report. Just the date, September 1949 was written in. On the back the transmission schedule was printed and included 7270 kcs at 7.5 KW. Des had written in his reported frequency as 4782 kcs. The next 2 QSLs were from stations regularly heard here in New Zealand as I have seen several of these verifications before. Radio SEAC (South East Asia Command) was a station in Colombo Ceylon, that was operated by the British Forces Broadcasting Service. Des’s QSL card was dated December 1947 and verified 17.77 mcs. Evidently it was a popular and entertaining broadcaster for the Armed Forces in South East Asia and was beamed in that direction. In 1949 the station facilities were handed over to Radio Ceylon. 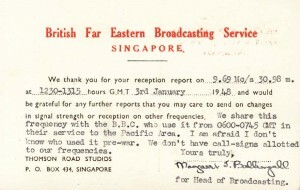 The second QSL card was from the British Far Eastern Broadcasting Service, Singapore. This station was established when the South East Asia Command moved to Singapore in 1945. 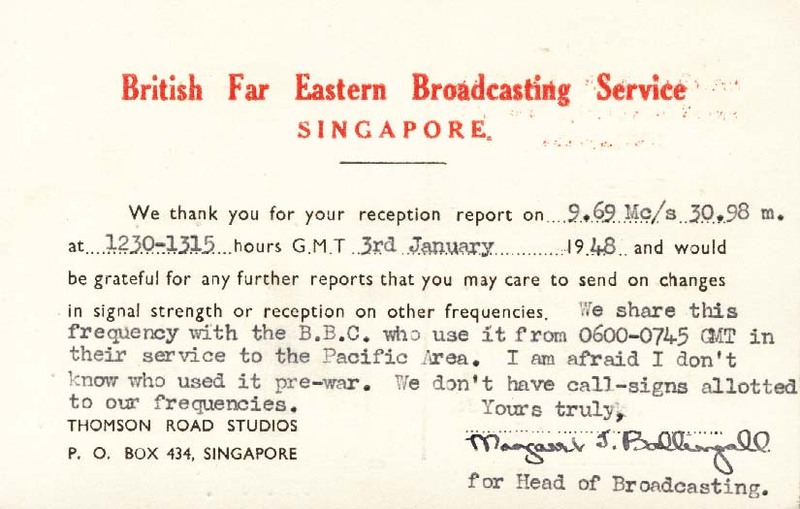 The BBC eventually took over this station in 1948 and it became the well-known BBC Far Eastern Station in Singapore. We now look to the Far East, China, which was still in a state of turmoil after the war. The first QSL was from XMAG S.S.O. Army Advisory Group, c/o San Francisco. It was a form letter verifying XMAG Nanking and said the station was an affiliated member of the Armed Forces Radio Service, through which it receives special features and transcribed programs. XMAG broadcast on both 1540 kcs and on 4275 kcs shortwave with 1000 watts. I am not sure what the purpose of this station’s broadcasts was for. The next QSL was a card from the British Commonwealth Forces verifying WLKS, Kure, Japan. The card was overprinted on a 6” x 4” lined index card, probably indication the difficulty in obtaining supplies in post war Japan. Also uncommon was the British Armed Forces using an American call sign. It was a full data QSL card dated April 1947 showing the broadcast frequency as 1470 kcs, and shortwave transmitting 1000 watts on 6105 and 2405 kcs. It was around 1947, that the US Government was putting into place plans for the future Voice of America service, as we know it today. Three QSL’s show this development. One, a letter from the Foreign Service of the USA verifies the Voice of America, Manila, Philippines on 15330 kcs The verification letter was written by the International Broadcasting Division c/o American Embassy, Manila. Another was a QSL card verifying KHRO, Honolulu on 9650 kcs. The United States Government, Central Pacific Operations, issued this QSL. Finally there was a card printed with ”The Voice Of America In North Africa” on it. This QSL posted from Algiers verified 11765 kcs for a May 1947 reception report. By 1949 the Voice of America was well established as a major international broadcaster around the world.